Whether called “supply-side economics,” “trickle-down economics” or perhaps more simply “Reaganomics” there’s no doubt that the theories enacted during President Ronald Reagan’s administration in the 1980s had lasting impact on the world economy. The architect of many of those theories was Arthur Laffer, who will be giving a free lecture “Trumponomics: The Road to Riches or Ruin?” at Stanislaus State on Thursday, Feb. 28 at 6 p.m. in Snider Recital Hall as part of the University’s Executive Speaker Series. The event is presented as a collaboration of the Stan State College of Business Administration and College of the Arts, Humanities and Social Sciences, with sponsors Winton-Ireland, Strom & Green and the Young America’s Foundation. Laffer served as a member of former President Ronald Reagan’s economic advisory board and also as an adviser for President Donald Trump’s 2016 campaign and administration. He was heavily involved with Congressional leaders in the development of the Trump tax cut that took effect in 2018. 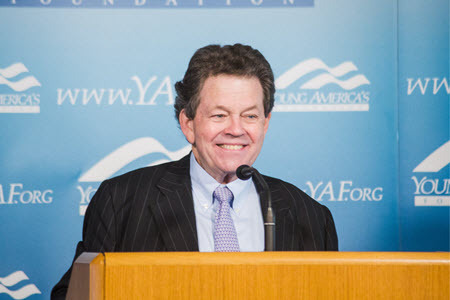 Laffer is expected to talk on multiple topics regarding the current administration’s economic policies, speculating on whether President Trump can bring about a new age of prosperity in America and if his policies can secure America’s position as the world’s leading economic power. Can Trump’s policies cut taxes, create jobs, and bring down the national debt, and does he have the necessary vision, strategy, and team to achieve these ambitious goals? His best-known theory is known as the “Laffer Curve,” which examines the relationship between tax rates and tax revenues, and establishes a theoretical point at which higher rates of taxation result in diminishing returns. He is founder and chairman of Laffer Associates in Nashville, a research and consulting firm for global financial markets. He has written several books, including “Return to Prosperity: How America Can Regain Its Economic Superpower Status,” and his most recent book “Trumponomics: Inside the America-First Plan to Revive Our Economy,” partially will be the basis of his talk at Stan State. In recent months, Laffer has spread optimism about the U.S. economy in the face of rising interest rates, the uncertainty of U.S. global trade policies and stock market volatility. He believes that the economy is heading into a major and sustained period of growth spurred by the 2018 tax cuts. While the lecture is free, those who plan to attend are asked to RSVP.